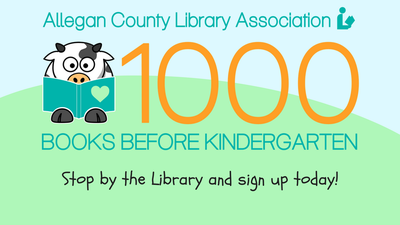 The Allegan County Library Association and Allegan County United Way have partnered to present 1000 Books Before Kindergarten. This program encourages you to read with your child and help them get ready to read! Sign up at the Library and get your welcome packet and first tracking sheet. After completing each sheet (100 books), come back to the Library and turn it in for a prize! Once you have read 1000 books, your child will receive a certificate and a photo opportunity at the Library!